Panderbear will address the broader, often pandered issue of "American Exceptionalism" sometime in the near future, but for now will confine himself to one particular respect in which the United States is undeniably exceptional - its wealth gap. Data for the chart comes from a 2006 study by the United Nations University World Institute for Development Economics Research (UNU-WIDER). The plot displays the Gini coefficient of wealth distribution for each of 228 countries. The Gini coefficient is a measure of the inequality of a distribution. A higher Gini coefficient indicates a more unequal distribution. In the case of wealth, if one person in a country owned everything its Gini coefficient would be 1. If everyone in a country had the same net worth then its Gini coefficient would be 0. Wikipedia has an extensive explanation of the Gini coefficient, but you may need to brush up on your integral calculus and discrete probability functions. In 2006 the United States had the 4th highest Gini coefficient for wealth distribution in the world. 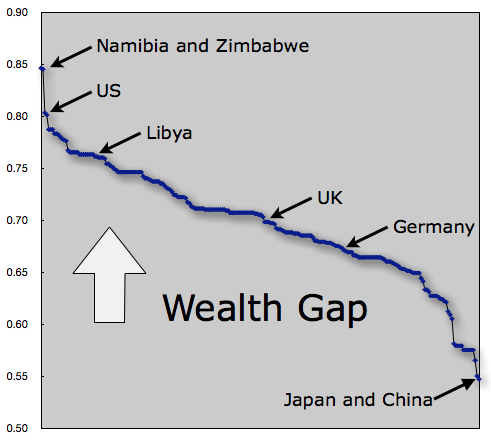 In terms of its exceptionally large wealth gap, the United States keeps the company of countries like Namibia, Zimbabwe, and Libya. Other developed economies like the United Kingdom and Germany have much lower Gini coefficients somewhere near the world mean. Japan and China have the most equal distributions of wealth in the world. The fact that these latter countries, especially China, have gained and sustain competitiveness in the global economy, suggests that economic success does not require significant wealth inequality, conservative pandering about pampering job-creators notwithstanding. Furthermore, there is considerable evidence that a large wealth gap can lead to economic and social instability. Fodder for a future post.